TMNT (also known as Teenage Mutant Ninja Turtles) is a 2007 American computer-animated martial arts action adventure film written and directed by Kevin Munroe. Based on the Teenage Mutant Ninja Turtles comic book series, the film stars the voices of James Arnold Taylor, Nolan North, Mitchell Whitfield, Mikey Kelley, Chris Evans, Sarah Michelle Gellar, Mako, Kevin Smith, Patrick Stewart and Zhang Ziyi and is narrated by Laurence Fishburne. It is the first Teenage Mutant Ninja Turtles film made with computer-generated imagery (CGI) created by Imagi Animation Studios as well as the first feature film in the franchise in 14 years. It is loosely connected to the original 1990-1993 trilogy. 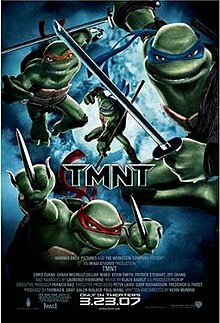 The film sees the four Turtles (Raphael, Leonardo, Donatello, and Michelangelo) grow apart after their final defeat of their archenemy the Shredder, when strange things are happening in New York City as ancient creatures threaten the world and the Turtles must reunite to save it. The film was released theatrically by Warner Bros. Pictures (making it the only film in the TMNT franchise to be distributed by that company) on March 23, 2007 to mixed reviews from critics yet was a commercial success, grossing $95 million worldwide against a budget of $34 million. Three thousand years ago, warlord Yaotl enters a portal into a parallel universe and becomes immortal, but his four generals are turned to stone. The portal also releases 13 immortal monsters that destroy his army and his enemies. In the present, the Teenage Mutant Ninja Turtles have grown apart. After defeating the Shredder, Master Splinter has sent Leonardo to Central America for training, where he protects a village from bandits. Donatello works as an IT specialist, Michelangelo works as a birthday party entertainer called "Cowabunga Carl", and Raphael works at night as the vigilante "Nightwatcher". April O'Neil operates a company that locates and acquires relics for collectors, assisted by her boyfriend, Casey Jones. April travels to Central America for work and finds Leonardo, telling him that the Turtles have drifted apart. April returns to New York City with a statue for wealthy tycoon Max Winters. Leonardo also returns, and April and Casey deliver the statue to Winters. Winters hires Karai and the Foot Clan to search the city for the 13 monsters before the portal opens again. Raphael encounters Casey, who reveals his knowledge of Raphael's double identity and joins him in hunting criminals. Winters, who is actually Yaotl and is still immortal, reanimates his stone generals. Leonardo returns to the sewer lair, meeting Splinter. Splinter forbids the Turtles from fighting until they can act as a team again. While training, the Turtles encounter one of the 13 beasts, Bigfoot, battling the Foot Clan. The Turtles engage Bigfoot, going against Leonardo and Splinter's orders. When Raphael visits Casey, they encounter Vampire Succubor, one of the monsters and witness its capture by the Foot and the Stone Generals, who spot them. Raphael is knocked unconscious. Casey takes Raphael back to the apartment while April calls the Turtles for help and reveals the identities of Yaotl and his generals. After being revived, Raphael suggests they pursue Yaotl, but Leonardo forbids him to go until Splinter gives out the order. Raphael investigates alone. Leonardo, Donatello, and Michelangelo plan their next move, while Donatello discovers the next portal will open over Winters' tower. Splinter tells Leonardo that his team is incomplete, and that he knows what he must do. After 11 monsters have been captured, General Aguila questions Yaotl's actions. The generals conspire to betray Yaotl, wanting to remain immortal. Raphael encounters the Jersey Devil, one of the remaining monsters but drives it off. Leonardo fights Raphael, but when he breaks Leonardo's swords, Raphael is forced to leave. The generals seize Leonardo, intending to substitute him for the 13th missing beast, and Raphael decides to make amends by rescuing Leonardo. As the portal opens, Yaotl discovers his generals' treachery, while Splinter and the Turtles, accompanied by Casey and April, fight their way through the Foot Clan cordon and breach the tower. Yaotl reveals the truth to the heroes: he wants to be free of his curse of immortality. The generals reveal that they wish to preserve their immortality, but also to use the portal to bring in more monsters to conquer the world. Having refused to betray Yaotl in exchange for serving the Generals, April, Casey and the Foot Clan work together, searching for the final monster, the Sea Monster, while the Turtles fight the generals. Splinter and Yaotl fight off numerous monsters emerging from the portal. April, Casey, and Karai arrive at the tower with the Sea Monster. The Sea Monster crashes into the Generals, dragging them into the portal before it closes. Karai warns them to enjoy their victory while it lasts, claiming they will soon contend with faces from their past, which the Turtles suspect to be the Shredder. She and the rest of the Foot Clan depart. Yaotl, now mortal, honors the Turtles and Splinter, thanking them for fulfilling his wish before dissipating. Splinter places Yaotl's helmet among his trophy collection, as well as Raphael's "Nightwatcher" helmet and Michelangelo's "Cowabunga Carl" head. As they return to their roles as the shadowy guardians of New York City, Raphael says that the Turtles will always be brothers. Mikey Kelley as Michelangelo, the youngest of the Turtles who has been operating as birthday entertainer "Cowabunga Carl"
A computer graphics imagery (CGI) Teenage Mutant Ninja Turtles (TMNT) movie was first announced in 2000, with John Woo supposedly at the helm. That movie languished in development hell and Woo ultimately moved on to other projects. TMNT, executive produced by the TMNT co-creator Peter Laird, departs from the previous films' live action style and is the first and only CGI film in the series. Writer/director Kevin Munroe said that he wanted to do total CGI instead of live action and CGI turtles because it would be easier for the audience to "suspend disbelief for such an offbeat story" as there would be no break in the reality between CGI and live action. Producer Tom Gray explained that the decision to depart from the live action series was due to escalating budgets for the three films, and with each film making less than its predecessor, a CGI film became a reality. For example, the first film made $135.2 million on a budget of $13.5 million, and the third made $44 million on a budget of $21 million. Orange Sky Golden Harvest's rights to the franchise had expired, and Gray said the question arose there over a CGI TMNT film in 2004. Munroe stated in terms of the story line that ideas were floated as extreme as the Turtles being in space, but eventually it just came back to New York City, and the theme of the family that had fallen apart. When developing the screenplay, Munroe wanted to take on a less lighthearted tone or "less Cowabunga" and place an emphasis on dark elements as shown in the original comics to appeal to the mature audience. "I had a very specific tone because mixing that sort of action and comedy is a very specific thing. Most people were just coming and wanting to make it too funny. I think that version of the movie could do really well, but we wanted to do something where it sort of pushes the envelope a little bit more and says that animation is more than just comedic animals bumping into each other and farting!" Munroe said that in design and in the rendering of the animation, he was after the feel of a comic book. Karai was one of Munroe's favoriite characters from the comics and he "was the one who really pushed for Karai" to appear in the film. TMNT co-creator Peter Laird stated it takes place in its own universe separate from the previous films. However, director Munroe says the film exists in the same continuity as the other films, which was supported by the memento wall at the end of the film. Development and pre-production for TMNT began in June 2005 at Imagi's Los Angeles facility and the CGI animation was produced in Hong Kong, followed by post-production in Hollywood. In designing the New York backdrop, art director/concept artist Simon Murton stylized the familiar Manhattan skyline and urban landscapes: "We began with cinematic cues from certain black-and-white films from the 1940s and '50s. I really wanted to push the lighting and the environments to create the look and feel of an alternate reality." The animators that worked on the fight sequences were inspired by Hong Kong action films. Animation director Kim Ooi explains said that because of CGI they were able to "push and stylize beyond the limits of live action." Imagi used Maya with Pixar's RenderMan for the production pipeline's back-end. Jim Cummings was the only past TMNT actor to appear in this film, where he had previously contributed voice-work in the 1987 Teenage Mutant Ninja Turtles series. The film also features three voice actors for Ratchet in the Ratchet & Clank series, Mikey Kelley and Kevin Michael Richardson from the first game, and James Arnold Taylor from the others, playing Michelangelo, General Aguila, and Leonardo, respectively. TMNT would be Mako Iwamatsu's final acting role. Mako was announced as the voice of Splinter at the San Diego Comic-Con on July 20, 2006. He then died the next day, aged 72. A dedication to Mako appears at the end of the film's credits. Although Iwamatsu is the only actor credited in the role, Greg Baldwin performs a substantial portion of Splinter's dialogue in the finished film; Baldwin had already mimicked Iwamatsu's voice when he took up the late actor's role as Iroh in the concurrently-produced cartoon Avatar: The Last Airbender, and used this precedent to successfully lobby to join the cast of TMNT as Splinter following Iwamatsu's death. The licensed soundtrack TMNT: Teenage Mutant Ninja Turtles was released by Atlantic Records in 2007. The film was originally set for release domestically (USA and Canada) on March 30, 2007, which would have been the 17th anniversary of the release of the first TMNT film. The March 30 date was advertised in the teaser trailer and early posters, but the release was moved up to March 23. At the 2006 San Diego Comic-Con, the TMNT panel screened an exclusive preview that contained a Splinter voice-over with facial tests, concept art, muscle and dynamic fight tests, and a few comedic scenes. A sneak peek booklet containing storyboards, environment designs and character designs by comic artist Jeff Matsuda was also distributed at the convention. Several tie-in products were released in 2007. The McDonald's fast-food chain had the film-based toys to collect with the purchase of a Happy Meal. A series of action figures based in the film's characters was released by Playmates Toys. A novelization, adapted from Munroe's screenplay by Steve Murphy, was published by Simon Spotlight. A five-issue prequel comic miniseries was published by Mirage Comics. A home media edition of TMNT was released on August 7, 2007, for the DVD, HD DVD and Blu-ray. In 2009, a box set with all four TMNT films was released to celebrate the franchise's 25th anniversary. The DVD release contains several special features, including commentary on the feature by writer/director Kevin Munroe; an alternate opening and an alternate ending to the film, and interviews with some of the featured voice talent as well as the filmmakers. TMNT ranked number one at the box office on its opening weekend, beating 300 (the top film of the previous two weeks), The Last Mimzy, Shooter, Pride, The Hills Have Eyes 2, and Reign Over Me. Weekend estimates showed that the film made $25.45 million over the weekend of March 23–25, 2007. The film grossed over $95 million worldwide, including over $54 million domestically during its 91-day run in the 3,120 North American theaters. The review aggregation website Rotten Tomatoes calculated a 34% approval rating, based on 116 reviews with an average rating of 5/10. The critical consensus states, "TMNT's art direction is splendid, but the plot is non-existent and the dialogue lacks the irony and goofy wit of the earlier TMNT movies." On Metacritic the film has a score of 41 out of 100 based on reviews from 21 critics, indicating "mixed or average reviews". According to CinemaScore, audiences gave the film an "A-". Claudia Puig of USA Today gave a negative review, stating that the film "is trying for a new image. But it takes more than an awkward title attempting to sound cool to overcome its mundane plot and silly dialogue." Michael Ordona of the Los Angeles Times wrote that "despite the doll-like cartoonishness of the human figures, the filmmakers seem to expect us to take this animated romp seriously. Too seriously." Wesley Morris of the Boston Globe called the film "a junk-food pastry. The plot is the wrapper. The action is the oily sponge cake. And the message—family, family, family—is the processed cream filling." Conversely, Todd Gilchrist of IGN gave the film a positive review, calling it "a fun, action-filled adventure that will satisfy longtime fans and generate a legion of new ones, whether it be by virtue of simple storytelling, solid CGI, carefully-choreographed action, or just the spirit and energy that only the Turtles can create." Stephen Hunter of The Washington Post felt that the film "is technically superb and quite enjoyable as long as you don't bang your head against the plot, which will cause hot flashes, premature aging and fallen arches." According to Steven Rea of The Philadelphia Inquirer, the film is "not so dark or scary as to keep most kids away" and it "has a cool, noirish sheen. There's an attention to detail in the visuals and sound design that pushes it up several notches above most kiddie fare." The film received nominations for the Annie Award for Best Storyboarding in an Animated Feature Production and the Golden Schmoes Award for Best Animated Movie of the Year. Three beat'em up/action adventure game/platformer adaptations of the film were developed and released by Ubisoft in 2007 for a variety of video game consoles. A mobile game TMNT: The Power of 4 was also developed by Overloaded and released by uClick that same year. In addition, characters from the film are available in Ubisoft's 2009 Wii and PlayStation 2 fighting game Teenage Mutant Ninja Turtles: Smash-Up, while artworks from the film are available in this game as unlockable content. ^ "2007 - Chinese Theatres". TCL Chinese Theatre. Archived from the original on November 26, 2014. Retrieved July 29, 2014. ^ a b Joe Strike (2007-03-23). "TMNT: The Turtles More Animated in CG". Animation World Network. Archived from the original on 2007-05-03. Retrieved 2007-03-23. ^ Martin A. Grove (2007-03-31). "$35 million budget puts TMNT on road to profits". Hollywood Reporter. Retrieved 2007-03-31. ^ a b "TMNT (2007)". Box Office Mojo. ^ Topel, Fred (2007-01-14). "Smith's 15 Seconds of "TMNT" Fame". Rotten Tomatoes. Retrieved 2013-08-05. ^ Brian Linder (2001-06-30). "Teenage Mutant Ninja Turtles: The Real Deal". IGN. News Corporation. Retrieved 2007-03-11. ^ Anthony Breznican (2006-12-20). "Slow to return, teen Turtles are back!". USA Today. Retrieved 2007-03-21. ^ a b c d e Heather Newgen (2007-01-25). "TMNT Studio Visit!". Super Hero Hype. Retrieved 2007-03-21. ^ Martin A. Grove (2007-03-20). "Turtles live again in CGI spinoff TMNT". Hollywood Reporter. Archived from the original on 2007-03-26. Retrieved 2007-03-25. ^ Davis, Erik. (March 23, 2007) Interview: 'TMNT' Director Kevin Munroe – The Moviefone Blog. Blog.moviefone.com. Retrieved November 29, 2011. ^ "Peter Laird's TMNT blog: Blast from the Past #654: April 1, 2005: Re: first pass and 2 other things". Peterlairdstmntblog.blogspot.com. 2013-06-28. Retrieved 2013-08-05. ^ a b Armstrong, Josh (August 19, 2014). "Director Kevin Munroe revisits Imagi's TMNT franchise". Animated Views. Retrieved August 19, 2014. ^ a b "Imagi Media Kit" (PDF). Imagi.com.hk. Archived from the original (PDF) on 2007-09-28. Retrieved 2007-03-21. ^ a b "TMNT Production Notes" (PDF). MovieWeb. Archived from the original (PDF) on 2008-10-06. Retrieved 2007-03-17. ^ "More Sign Up for "Ninja Turtles"". WorstPreviews. 2006-12-22. Retrieved 2006-12-30. ^ Anne Neumann (2007-03-06). "Kevin Munroe on TMNT". Super Hero Hype. Retrieved 2007-03-21. ^ "Baldwin implicitly confirms his role as Splinter while answering fans' questions at an Avatar forum". Distanthorizons.proboards.com. 2007-10-18. Retrieved 2013-08-05. ^ "iTunes - Music - TMNT: Teenage Mutant Ninja Turtles: Music from the Motion Picture by Various Artists". Itunes.apple.com. 2007-03-13. Retrieved 2013-08-05. ^ "TMNT Teaser Trailer". Trailer Addict. 2007-03-23. Retrieved 2013-08-05. ^ Omar Aviles (2006-07-25). "CON: WB Animation". Joblo. Retrieved 2007-03-24. ^ "TMNT Sneak Peek #1". Searchlightcomics.com. 2013-01-07. Archived from the original on 2013-02-01. Retrieved 2013-08-05. ^ "Mcdonalds Teenage Mutant Ninja Turtles Leonardo Toy 2007: Toys". Amazon.com. 2013-02-19. Retrieved 2013-08-05. ^ "Teenage Mutant Ninja Turtles". Playmates Toys. Archived from the original on December 29, 2008. Retrieved February 1, 2013. ^ "TMNT Movie Novelization by Kevin Munroe (Screenwriter), Steve Murphy (Adapted by) - New, Rare & Used Books Online at Alibris Marketplace". Alibris.com. 2007-03-30. Retrieved 2013-08-05. ^ "TMNT Movie Prequel (Mirage comic book) - 5 issues". Comicvine.com. 2007-03-01. Retrieved 2013-08-05. ^ "TMNT Blu-ray". Blu-ray.com. Retrieved 2013-08-05. ^ "Teenage Mutant Ninja Turtles: 25th Anniversary Film Collection : DVD Talk Review of the DVD Video". Dvdtalk.com. Retrieved 2013-08-05. ^ "Teenage Mutant Ninja Turtles Top Box Office With $25.45M Debut". Fox News. Retrieved 2013-08-05. ^ "TMNT (2007)". Rotten Tomatoes. Fandango Media. Retrieved November 21, 2018. ^ "TMNT". Metacritic. CBS Interactive. Retrieved September 4, 2012. ^ Puig, Claudia (March 23, 2007). "'Turtle' chortle, 'Mimzy' whimsy". USA Today. Retrieved September 4, 2012. ^ Ordona, Michael (March 23, 2007). "Ninja Turtles get seriously animated". Los Angeles Times. Retrieved September 4, 2012. ^ Morris, Wesley (March 23, 2007). "'TMNT' has style, lacks substance". The Boston Globe. The New York Times Company. Retrieved September 4, 2012. ^ Gilchrist, Todd. "TMNT". IGN. News Corporation. Retrieved April 26, 2012. ^ Hunter, Stephen (March 23, 2007). "'TMNT': Testudinal Fortitude". The Washington Post. Retrieved September 4, 2012. ^ Rea, Steven (March 23, 2007). "Turtles, a little soft in the shell, get back in the soup". The Philadelphia Inquirer. Retrieved September 4, 2012. ^ a b "35th Annie Awards". Archived from the original on 2010-08-15. Retrieved April 26, 2012. ^ Levi Buchanan (13 March 2007). "Teenage Mutant Ninja Turtles: Power of 4 Review". IGN. Retrieved 2013-08-05. ^ Ubisoft. "Official Site | Teenage Mutant Ninja Turtles: Smash-Up™ | Ubisoft". Tmntgame.us.ubi.com. Retrieved 2013-08-05. ^ "TMNT: Smash-Up Cheats, Codes, Unlockables - PlayStation 2". IGN. Retrieved 2013-08-05.